During the 2008 campaign, Barack Obama promised to end the Iraq War. During the 2012 campaign, he promised that he had ended the Iraq War. The bombing campaign now underway against ISIS Islamo-lunatics makes clear that the second promise is null and void, and therefore, the first is as well. And so the extensive catalogue of broken Obama has some new additions. The president desperately wants to convince us – and, I think, himself – that he has not revived the Iraq war with his “limited” bombing campaign. But make no mistake about it, we are at war. And it’s the identical war George W. Bush had been fighting, and had mostly succeeded in putting an end to before Obama took over the reins. We’re again fighting Sunni extremists. Obama’s policy of crossing his fingers and trusting Iraqi Prime Minister Maliki to worship at the alter of Thomas Jefferson has failed. In a formulation that should have provoked peals of laughter, Obama at first claimed Thursday night that by bombing ISIS he was merely trying to prevent a humanitarian disaster and protect U.S. citizens in the Kurdish capital of Irbil. Really. So now it is U.S. policy to bomb sovereign countries when U.S. citizens who live there are endangered? That would be pretty chilling for the rest of the world if it were the least bit true. But the bombing is about much, much more. By Saturday morning, Obama was beginning to admit that in fact U.S. fighter jets would be used to help the Kurds battle ISIS, and that the United States would also be conducting counterterriorism operations against the terrorists because of their very public intention to eventually strike the United States. Get your head around it, Mr. President: WE ARE NOW THE AIR FORCE FOR THE KURDISH PESH MERGA. And eventually, for whatever elements of the Iraqi army aren’t busy tearing off their uniforms and pretending to be farmers. The president botched Syria, failing to place a bet on more moderate Syrian rebels. I know, I know, there may not have been any moderate Syrian rebels. But given that Assad is our sworn enemy and that we knew there were certainly immoderate Syrian rebels, it was worth a try. Obama failed to act against ISIS when it was staging its troops for an Iraq invasion, or anytime afterward when we might have been able to defuse the situation. This, I believe, was at least partially because Obama knew it would be an admission that the war, Bush’s war, wasn’t over. Obama failed to maintain, as he was advised by many to do, a presence of several thousand troops in Iraq. This would have helped maintain stability – Iraqi Prime Minister Maliki started arresting his opponents literally the day after U.S. troops departed – and allowed us to maintain monitoring capabilities that could have helped us respond early to ISIS. The chaos around us, in Iraq and elsewhere, didn’t just happen. It was permitted to happen. Stability is not a natural force. The tendency of objects is to come apart, not together. Stability, or relative stability, is something that was maintained in the postwar period by wise U.S. leadership. For the past five and half years we have had unwise leadership. And so instability and chaos have taken root and sprouted, like an untended garden. Remember, before the United States busted things apart, Iraq was held together only because of a ruthless, pitiless dictator. Since Obama did not provide a modicum of force to hold things in place, something we’ve done in all places where U.S. forces have been victorious, things fell apart. 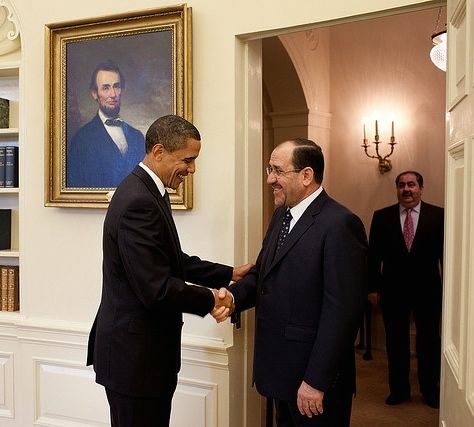 Today, I’m proud to welcome Prime Minister Maliki — the elected leader of a sovereign, self-reliant and democratic Iraq. We’re here to mark the end of this war; to honor the sacrifices of all those who made this day possible; and to turn the page — begin a new chapter in the history between our countries — a normal relationship between sovereign nations, an equal partnership based on mutual interests and mutual respect. With respect to security, Iraqi forces have been in the lead for the better part of three years — patrolling the streets, dismantling militias, conducting counterterrorism operations. Today, despite continued attacks by those who seek to derail Iraq’s progress, violence remains at record lows. Turns out it was actually due to the presence of U.S. forces. And that’s why Obama, and not uncontrollable world events, is responsible for his own broken Iraq promises. To think we have 2 years left of this buffoon. Hopefully we will survive. Frighteningly, I’m beginning to hear that same concern expressed more and more. It occurred to me this morning that when Barack Obama set his laser-like focus on assuming personal responsibility for the “safety and well-being” of the Yazidi refugees, being stuck on a mountain with no food or water surrounded by barbarians intent on slaughtering and beheading them suddenly became the second-greatest challenge these people faced. All of these things may have in fact been “allowed” by Val-Jar? Probably her bright idea to release those 5 terrorists we traded for Bergdahl to Qatar — reportedly providing funding and support for ISIS. You have the language all wrong. Obama did end that war, by his own admission. This is a new war that he has started and owns from beginning to end. The time, research and analogy Keith puts into this is so appreciated. While the readers here know most of this, the occasional in-depth regurgitation is the reminder I need. I never figured that one out. What it did for me was to make the Nobel forever worthless. So sad for all of the previous, legitimate winners. I love how he calls it a “project”–like the science fair. While I feel for the Yazidis, I oppose intervention. Bush was guilty of overestimating Saddam’s progress in reconstituting Iraq’s WMD programs and bought into the neoconservative fantasy that all people’s yearn to be free and worship at the alter of Jeffersonian democracy. However; Bush had the integrity to commit the US to occupy Iraq and launch the surge that resulted in pseudo stability that could be maintained only with a continued US presence. Obama knowingly and intentionally destroyed everything that Bush had worked for and US troops had bled and died for simply as a repudiation of Bush. Americans should oppose any US military action because of Obama’s questionable sanity. Obama has overthrown Daffy Gaddaffy (who had surrendered to Bush) and Mubarak who had been a US ally for three decades to advance his Arab Spring fantasy, the entire middle east is in chaos. Obama is even flirting with the risk of nuclear war with Russia by orchestrating the confrontation in Ukraine. Until this imbecile is out of office, we should not interfere anywhere. I am not sure where I stand. I hear some are escaping from the mt…yes, these ISIS or ISILs or whatever are bloodhirsty fanatics…but we don’t seem to be lucky–favored–in these regions. I know that sounds weak, but it just isn’t our element. We have to go home–they don’t. They have the beliefs, we don’t. Our leader is not manning a charge–it’s half measures…it’s so quicksandy. Agree. We don’t have a plan, or an exit strategy. It’s possible that we don’t have all the facts or intel that MrO is using to justify engaging the terrorists in Iraq, but considering that everything comes out sooner or later, he owes us a detailed explanation of why we are back bombing Iraqis again without a declaration of War.. It is indeed quicksandy. That’s why so many of us are scratching our heads asking, “How’s this going to end? What’s the next step? How deeply should we wade into this mess?” There is no real strategy, no sensible operational tactics, no vision, no believable, doable objective coming from Obama. It’s like having the “what do we do now?” question answered by the characters from the television show “Third Rock From The Sun”. It is indeed quicksandy. That’s why so many of us are scratching our heads asking, “How’s this going to end? What’s the next step? How deeply should we wade into this awful mess?” There is no real strategy, no sensible operational tactics, no vision, no believable, doable objective coming from Obama. It’s like having the “what do we do now?” question answered by the characters from the television show “Third Rock From The Sun”. That is genocide plain and simple. These people need to be rescued. As for the rest. I don’t see it as intervention. ISIS has now declared and is establishing a terrorist nation state — they have territory, and resources. They are in active recruitment mode. They are disciplined, regimented and well armed. Either wait for them to get stronger or do it now. They are our enemy make no mistake about that. And they will come for us. Of course, they could make it easy on everybody and simply send some people across our southern border and go from there. When they leave the mt–where do they go? They can’t go home–they are various forms of infidel. To Jordan–half the population is already refugees…Syria….where do they go…I want to know…I am not being sarcastic. Can we just load them up and bring them here? Is that next? It is a good question. The sad thing is the destruction of ancient civilizations and memorials in the ME by these terrorists — the tombs etc. As for the Yazidis –my real knowledge of facts is superficial, but apparently they have been there for 100s if not culturally 1000s of years — will be culture shock — somewhere there might be a safe haven in the ME. But all the while this continues,so does the relocation and institutionalization of the central american illegals here in Amerika. I just listened to Gen. Mayville take questions. From what he explained, they do not have any answers at this point of where they will bring them. I do not know what to do at this point as well. All I know is, it is horrific. He is at a beach today, and we are trying with all of our heart to put this together, and what should be done. I can’t see how he can take a golfing vacation in the middle of this. I’ll field this one: He is a sociopath. He is totally disconnected from reality. He doesn’t give it a second thought. Easy. He can be connected to anywhere in the world from the Vineyard or anywhere else. He also took Susan Rice and Ben Rhodes to his vacation spot with him…as if their counsel is worth anything. Bottom line is that our president is clueless and molds the situation to fit his personal whims and narcissism. We are a most compassionate people, and yes we should provide food and water for these Kurds trapped on a mountaintop. We would be more compassionate if we also sent boxes of ammo and some AK-47s to these embattled victims to protect themselves..
How is it that @50,000 Kurds had nary a firearm to protect themselves before they chose to flee when so many other Iraqis are armed with any and all manner of firearms? Once again, this Obama administration is too late with too little or the wrong kind of assistance for those who depend on us for their safety. It’s not clear what the final objective of these bombing raids or evacuations of the Kurds means, or if there is a final objective at all. Do we defeat the crazed terrorists the same as we supposedly defeated al Quada, or the Taliban by claiming “we won”? Are we forever to protect the Kurds from attack, is there a new plan for them? The Kurds are holding their own. We apparently are sending them some badly needed weapons. That said, if I were the Kurds, I would take what I could but not depend on Iraq Baraq. The US is no longer a reliable ally. They took back two hamlets from the head choppers, acc to Fox. The terrorists took the flags off their trucks, lest they be zapped. All we know is from these dopey TV channels–I see correspondents in their flak jackets and think, I don’t need to know so much–go home to your kids. This is so not worth it. When I see Retchin Carlson sunnily parroting along–as if she were making a nice casserole…I just feel hopeless. I don’t know whether to laugh or cry. ride with him after one of the AF/AM parties last week whereby he was able to inform him of the genocide going on atop the mountain. I must say, it’s great sport to listen to all of the commentators, Libs and Repubs alike, playing Obama’s contradictory, muddled, incoherent sound bytes concerning Iraq from the last few years. Included in one ot these was the debate with Romney where Romney said ‘You (obama) wanted to keep residual forces in Iraq”… Obama responded “That’s not true”. Liars can never, ever remember what they said from one minute to the next. Delusional narcissistic liars are the absolute worst. Anybody seen Hagel? Wandering the long lonely halls of the Pentagon? In the basement of DOD looking for something, anything? Wherever he is I hope he stays there. lol. No doubt he’s wondering how this all fell apart when all he was told the mission would be is to transform the standing military into the equivalent of a gay bar. The Pentagon might want to rethink releasing or firing hundreds of high-ranking officers, and the push for transgender soldiers. Obama golfing before was never that big a deal to me. Now with these MV daily outings, with the world in chaos, it looks just plain delusional. Seriously delusional — not funny delusional. I’ve asked before, and I’ll ask again: If Obama were suffering from serious – SERIOUS – emotional issues, isolation, detachment, depression, schizophrenia, etc. – perhaps even with drug therapy – would this administration tell the American people? And would we have a right to know? It sure looks like he has a severe case of malignant narcissism/megalomania. But we do know positively that he has a terminal case of malignant incompetence. It’s up to Congress to diagnose and ‘treat’ him with a few doses of (Im) Peach Mint. Of course the American people have a right to know! Right now, I very much doubt Barry would pass a drug test. He certainly has psychological problems. It seems more and more people are beginning to question his fitness to hold office. Saw Tom Friedman (don’t get me started) talking about his interview with Obama–what is this “we need a govt in Iraq that does not have a victor/vanquished attitude”–what does he think war is–everybody gets a trophy like preschool? We have victor/vanquished HERE–remember all that “We had an election and we won” stuff? Winning is how we keep score–oh, that’s right, no score anymore. Where did I putm y demerol drip–it’s around here someplace. Good points. I always thought those two words “I won” were the catalyst to every objection, every refusal to engage, and the lack of even the most benign cooperation from the Repubs. Also looks like his former bid Maliki doesn’t feature being vanquished. Kudos to you for reading that. I scanned it — Friedman and Obama together — insufferable — and not a drop of truth or useful information. True confessions–heard parts on MoJoe. Star, Here’s another take on the interview. Obama also identifies Republicans as the real threat. It’s worth a click just for the pix Obama in his dictator digs. Lt Gen William Mayville, Jr. is taking questions now. I missed the first couple of mins. If anyone caught important information, please share. This is what I caught. White House caught off guard. They asked why wasn’t more advance notice provided? He said: They have been consistant about that region. There have been 15 Airstrikes, unlikely stopping movement of ISIS. They are arming the Kurds. Asked about: Safe corrider for people on mountain. He said It is complicated. Did I miss anything? I jotted down what the lady on Fox read though, after the General spoke. Would love to know how everyone feels about this issue, at this point. Keith, I disagree about the “Moderate’ Syrian Rebels, “defectors” from the estimated 20,000 Free Syria Army militia Obama armed and trained make up the a big part of Islamic State’s core. While there may be some truth in the reports the American weaponry used by Islamic State was captured from routed Iraqi forces.. We gave them a lot of the stuff ..